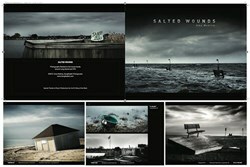 Noted Long Island photographer Amy Medina is publishing a photo book on the destructive effects of Hurricane Sandy on the beaches and structures around New York City and Long Island, NY. The book chronicles the aftermath of the storm on the natural and man-made landscape of the downstate area of New York in poignant, emotionally charged images taken throughout the area immediately following the “Super Storm of the Century”. Hurricane Sandy was dubbed a “Super Storm” as the hurricane hit the New York/New Jersey area at the same time as another storm front and coincided with normal high tides. Causing massive flooding that forever changed the natural landscape while destroying beaches, homes and businesses from Manhattan to Montauk, thousands of residents lost their homes and businesses and over a million more were without power for weeks. Hurricane Sandy’s storm surge hit New York City on October 29, 2012 flooding streets, tunnels and subway lines and was the second-costliest hurricane in United States history (after Katrina in 2005). The largest Atlantic hurricane on record, with winds spanning 1,100 miles, Sandy was the deadliest and most destructive hurricane in recorded history. According to reports compiled on Wikipedia, estimates as of June 2013 assess damages to have been over $ 68 billion with at least 286 people killed along the path of the storm. One of Medina’s images has been selected as the Cover Photograph for the International Center of Photography and the Museum of the City of New York’s "Rising Waters" exhibition on Governor's Island. The show features photos from Hurricane Sandy and will run through the end of September. Drawn from an open call for submissions from the public that drew over 5,000 entries, the exhibition includes 100 works by more than 90 professional photographers, community members, and bystanders who photographed the effects of the devastating storm and the subsequent recovery efforts. Medina will be donating partial proceeds of the book sale to The Robin Hood Foundation, which has already granted millions of dollars to many worthy organizations helping people impacted by the storm. “They do great work,” Medina said. “They have assured me their Hurricane Sandy grantees will continue to receive money as long as donations are coming in.